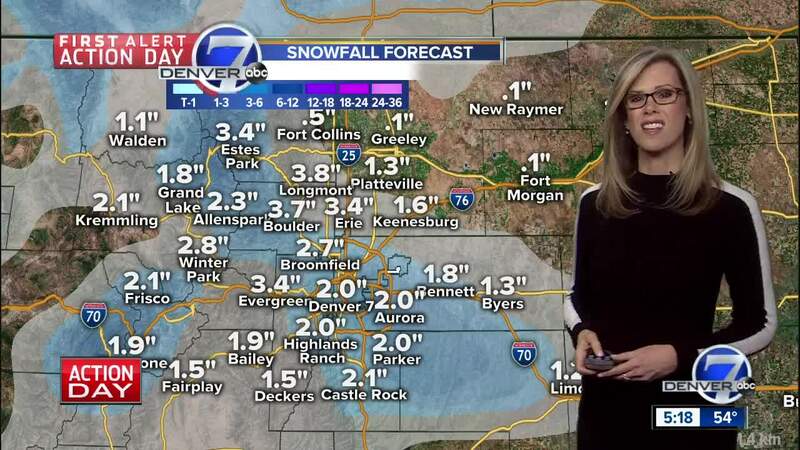 Meteorologist Stacey Donaldson has the latest on snow heading our way for Monday. DENVER — Tonight and Monday, another cold front will arrive with a chance for 2 to 6 inches of snow in the mountains and 1 to 3 inches of snow for Denver. Expect the Monday morning commute to be snowy and slow. Temperatures will be much colder again with highs in the teens and 20s in the mountains and upper 20s to low 30s in Denver. Winds will also be gusty at times, making it feel much colder than the actual temperature. By the later afternoon, skies will be clearing for the Front Range. We will slowly warm up for the rest of the week with sunshine sticking around.